Syllabus of the Online Course (Subject): Trade Preferential System among the Member States of the Organisation of Islamic Cooperation (OIC). Description of the Online Course: Trade Preferential System of the OIC. The Member Countries that have signed only the Framework Agreement + PRETAS of the Trade Preferential System are the Arab Republic of Egypt, Guinea, Indonesia, Iran, Mauritania, Niger, Palestine, Sudan, Somalia, Tunisia, Sierra Leone, the Gambia, Guinea-Bissau, Burkina Faso, Cameroon, the Comoros, Djibouti, Benin, Nigeria, and Ivory Coast. 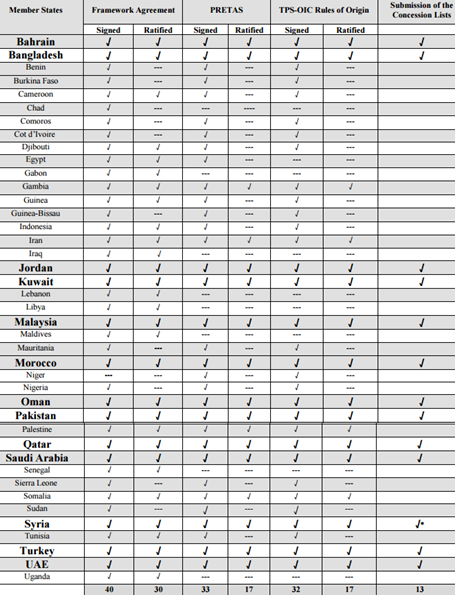 The Member Countries that have signed only the Framework Agreement of the Trade Preferential System are Brunei Darussalam, Chad, Gabon, Iraq, Lebanon, Libya, Maldives, Senegal, and Uganda. 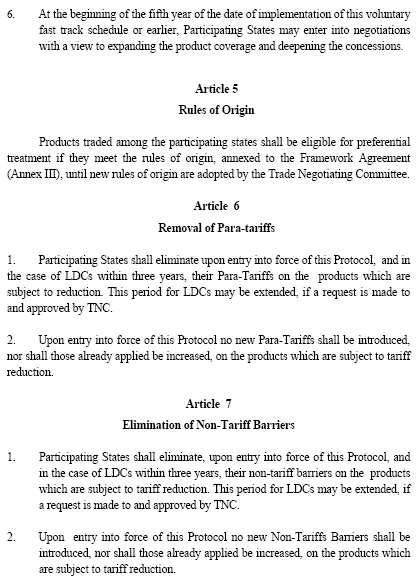 The Member Countries that have not ratified/signed the Framework Agreement (not members of the Trade Preferential System OIC) are Afghanistan, Algeria, Albania, Azerbaijan, Guyana, Kazakhstan, the Kyrgyz Republic, Mali, Mozambique, Suriname, Tajikistan, Togo, Turkmenistan, Uzbekistan, and Yemen. The Trade Preferential System among the OIC Member States entered into force on October 2003. 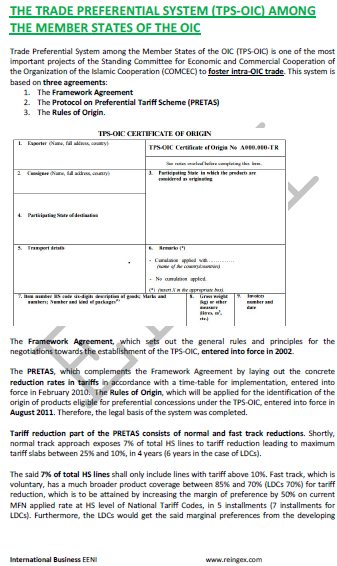 The Preferential Tariff System for TPS-OIC (PRETAS) defined: rate of tariffs and para-tariff and non-tariff reduction (effective in 2010).